A game for describing emotions is the first step to starting to develop an emotional conscience, achieving greater self-control and managing to regulate emotions properly. Four fun games that allow you to train the blowing strength, blowing control and to exercise directional skills. To develop a correct respiratory pattern. 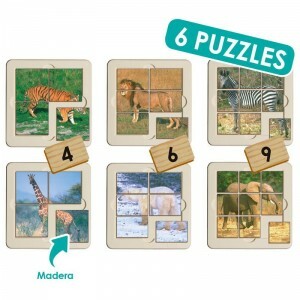 Set of 4 jigsaw puzzles made of wood. With 48 pieces each. Also includes posters of the pictures. Chopping tray with a safety frame to hold paper. Felt surface: resists wear and tear. The base of the tray prevents damage to the work area. With space to store the ergonomic awl. Includes templates to start in pre-writing. 54 photographs which represent basic adjectives. A briefcase containing 216 letter cards with capitals on one side and lower case on the other. Do we know what we’re eating? This game lets you discover the most common food, allergies and intolerances, which foods cause them, and what symptoms they can cause. 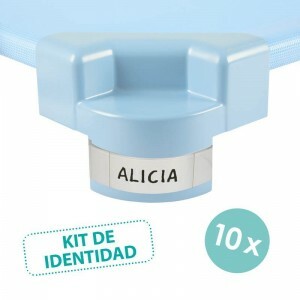 Developed in collaboration with CGD-NE (General Council of Dieticians-Nutritionists of Spain). Observe the different pictures, put yourself in the character’s shoes, and try to guess what they’re thinking. High quality wooden supports to hold cards (up to 3 mm thick). Includes two supports of 22.5 cm. Set of ergonomic laces for little hands to practice lacing and linking objects. HUMAN BODY: WHAT AM I LIKE? A fun way of learning about the different parts of the human body and discovering what we’re like inside and outside. Helps children to identify which activities they usually do and to think about how they can balance them. The aim of the game is to make children aware of the risks of doing too much of one activity so they can learn how to balance their free time with different activities. Large multisensory tray for developing pre-writing skills and hand-eye coordination by creating figures through touch. Create fun routes by lacing the cards according to colour and texture. Spin the roulette wheel and play at inventing mathematical problems! Developed by José Antonio Fernández Bravo. Natural silica sand, washed and dried, to develop the creativity of the little ones. Cards to develop the mathematical sense and to understand the numbers up to 10. To work intuitively: composition, decomposition, equality, equivalence, addition and subtraction. Developed by José Antonio Fernández Bravo. Travel back in time, and in each pair of pictures discover the progress of the inventions that have changed history. Emotional Intelligence Specialist. President of the Francesco Tonucci Pedagogical Association (APFRATO). Speech therapist specializing in language and communication disorders. Active researcher and author of the Logo-Bits Method. Expert in neurodidactics for mathematics education. Writer, teacher, trainer, researcher and university professor. Collaborator in the Department of Early Childhood and Inclusive Education of UNESCO. Speech therapist specializing in French language and communication disorders. Bullying Specialist. Co-author with Iñaki Piñuel of the Cisneros VII Report "Violence and Bullying in Schools". Mathematician, university professor and specialist in teacher training. 2012 Blogs Award for the Best Education Blog. At Akros we know how important it is for parents, teachers and education specialists to ensure that children learn in a fun, simple, enjoyable and motivating way. And we know it's not easy to find games that meet those characteristics: teaching and having fun at the same time. Children need games that spark their interest and allow them to develop creativity and imagination. Games have to help them to know and understand the world around them, but not only through reason. Experiencing through the senses, being able to understand and feel different emotions, being able to associate and transfer what has been learned from one area to another of knowledge... It is also learning. The most significant learning occurs when the positive skills, resources and emotions of the youngest children are put into action. The way in which each child learns is different and therefore the games have to be adapted to the different characteristics of each one. We strive to get our games to help them develop their abilities, enhance their skills, and allow them to learn what is hardest for them. We have games to improve speech and pronunciation, to learn to read, to enhance memory and attention, to increase autonomy, to promote good nutrition, to educate in values, and to develop the senses... Games to turn the youngest children into great people. We believe that the future depends on children and from Akros we feel responsible for bringing play and learning to all of them. We believe in children who are capable, capable of learning, capable of feeling, able to laugh, to create, to dream and to imagine. We believe in them and create for them. That's why we manufacture games that adapt to the needs of the little ones. We work with specialists who help us develop games that allow parents, teachers and professionals to improve the abilities of their children or students in a simple, playful and effective way. We develop games for children with ADHD, ASD, hearing, visual, motor or intellectual disabilities, learning disorders... inclusive games to play at home and in school. To feel integrated and included in their environment. Games so that they can develop and work on their abilities: memory, attention, emotional intelligence, communication, autonomy or cooperation. Because every child is different and extraordinary. Because we believe that they should be taught to think for themselves, regardless of their starting point. We design and manufacture games that allow them to develop, improve, have fun and learn. We believe in their abilities and our games and materials are made by and for them. We work to get all children to learn with a smile.